The first habitation of the site dates from the Neolithic and Early Minoan period (3rd millenium B.C.). In the late Classical period (beginning of the 4th century B.C.) 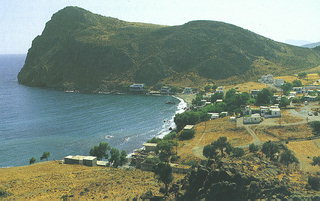 the Gortynians established the sanctuary of Asklepios at the harbour. During the tremendous earthquake of 46 B.C. the city was destroyed and subsequently rebuilt. In the Early Christian and Byzantine periods, a small settlement developed and the basilica was erected. The small Byzantine church of St. John was built in the 14th century. The archaeological investigation of the site started after the first visit of the English captain H. Spratt, in the middle of the 19th century. Excavations were carried out by the Italian Archaeological School at Athens in 1900, 1910 and 1912-13, and revealed the sanctuary and other buildings. Since then no excavation had taken place in the ancient city until recent years, when the investigations of the Greek Archaeological Service brought to light the Minoan settlement and graves. Apart from consolidation work on the monuments, extensive restoration has not been carried out with the exception of the columns of the temple of Asklepios which were immediately restored by the excavators.